Who dares to invade our haven in search of a cheap meal? 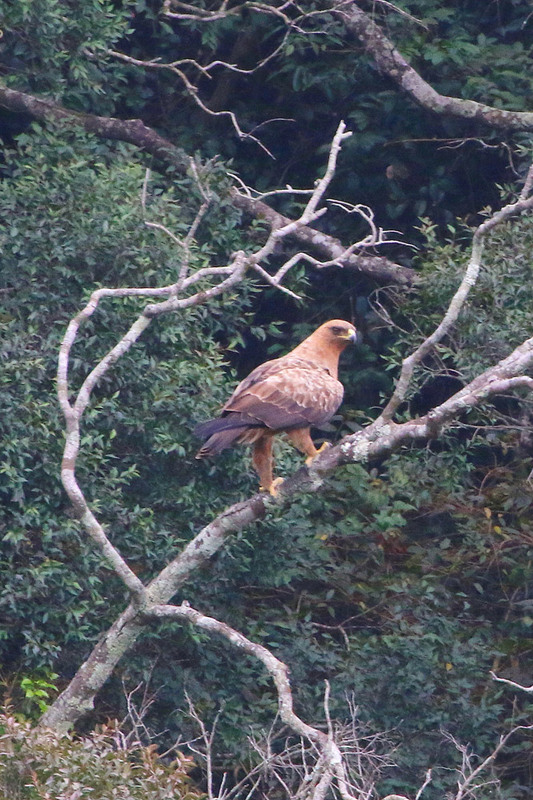 We have shown you something of the beauty and interesting features of the most common birds here in Kloof. We have seen where some of these birds have come from (the migrators) and how those that live here continuously (the locals) breed and build their family homes. We have also looked at how some of them feed. You wouldn’t think there could be anything that would threaten this haven of ours? The birds fly freely through the air, singing and spreading love and joy wherever they go. Their beauty can be stunning, and there is no doubt they have the ability to bring peace to the soul. But have you noticed how the little chaps never seem to sit still – try following their movements through your bins and see how difficult they are to follow. On the one hand they may just be looking for food (for most of them that is a full-time job), but maybe there is another reason for not keeping still – they are trying to keep out of harms way (as they seem to say in the army). Somebody else might see them as a cheap meal ticket. According to the current SABAP2 bird atlasing project our bird list here is now 299 species. Let’s ignore all those which have not appeared on at least 10 lists and we can then limit this list to about 233 species. Of that total no less than 29 (12,5%) of these birds have other birds on their menu. Most of these we would probably consider as casual clients who would include birds on the menu opportunistically – they would not hunt them down specifically for feeding purposes. 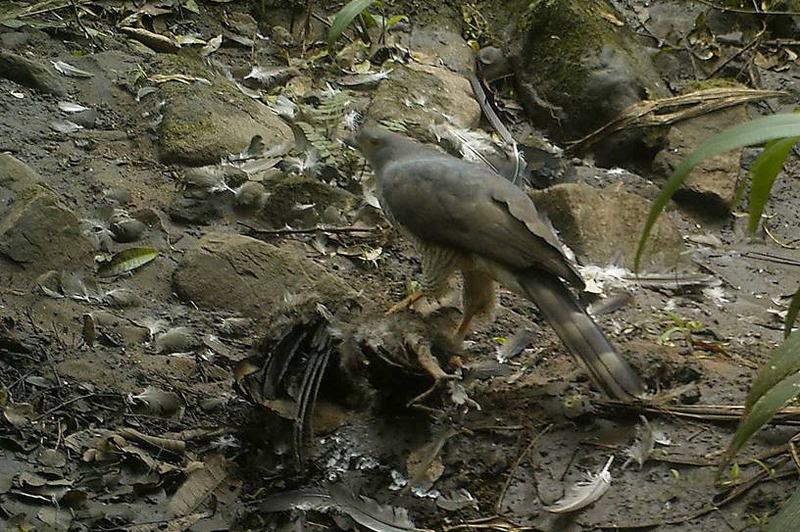 This photo was taken by a camera trap in the Kloof Gorge forest, showing an African Goshawk after taking out a Hadeda Ibis. 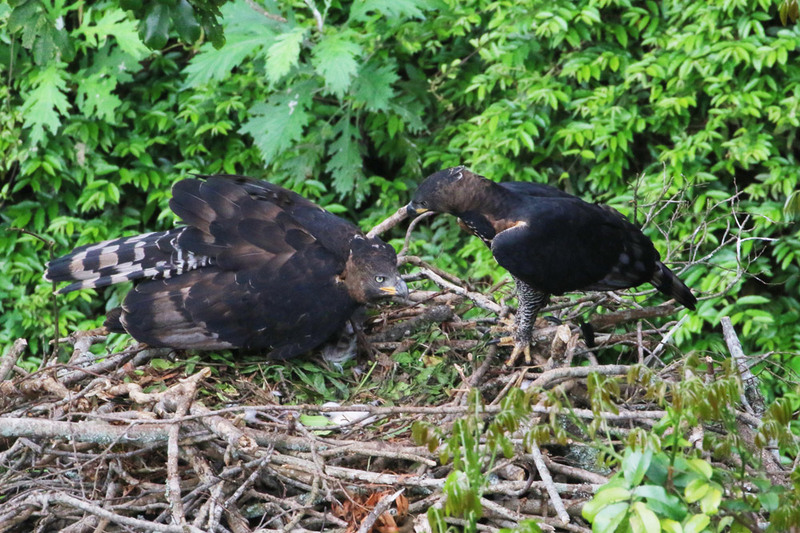 Later photos show an Immature Black Sparrowhawk finishing off the meal. All year round, usually before dawn, this Goshawk flies high over the forest canopy making measured click calls. 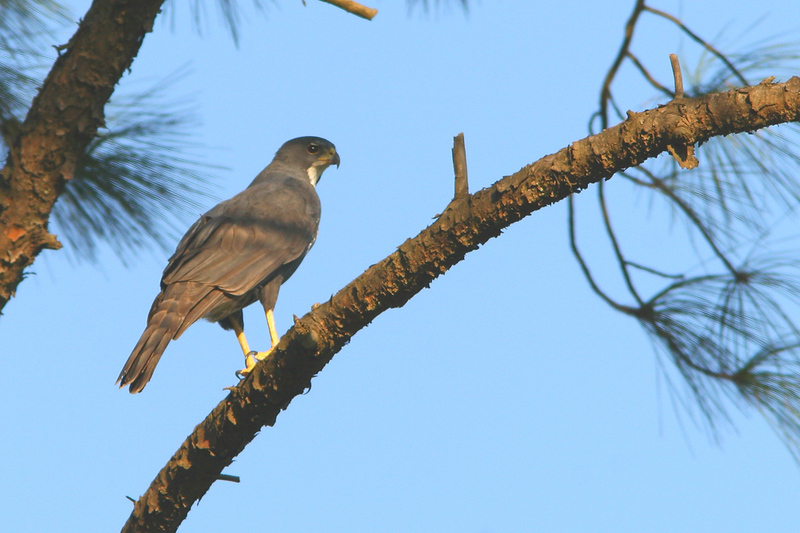 A forest bird, this raptor mainly still-hunts from perches in dense cover. Few of our birds are not on this Goshawk’s menu. Try this list – spurfowls, doves, fledglings and nestlings of all kinds, turacos, cuckoos, trogons, mousebirds, wood-hoopoes, hornbills, kingfishers, swallows, bulbuls, thrushes, warblers, pipits, puffbacks, starlings, mynas, weavers, mannikins and canaries. 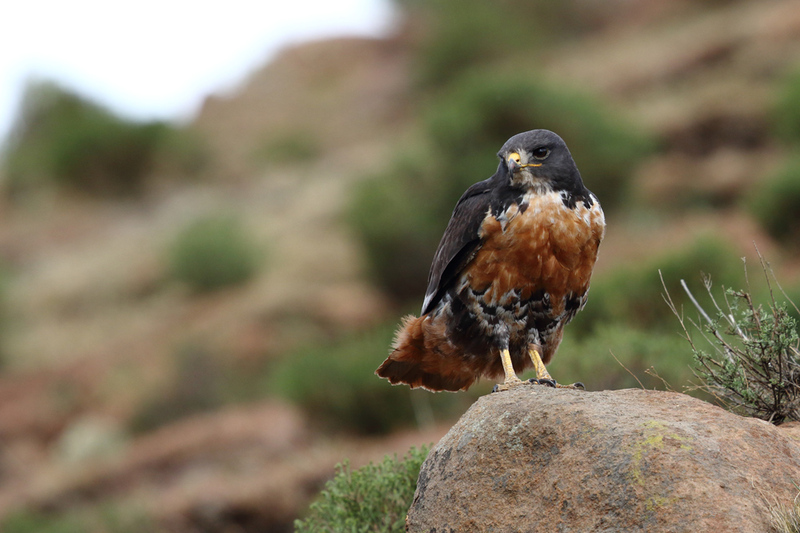 African Harrier-hawk: this photo is by David Allan showing its unique features very well. This is a most interesting raptor, the largest grey hawk in the region. It is easily identified by a strong white bar on its tail and a small pointed head with a patch of yellow skin on the face which flushes red when excited. Favouring woodland and forest edges it is notable for its habit of actively searching for prey by clambering around trees. A unique feature is the remarkable flexibility of the legs and feet. The long yellow legs and small feet are able to bend forwards and backwards, enabling it to reach into nests, holes and crevices to extract otherwise inaccessible prey. To locate prey it may soar low over the canopy which stimulates mobbing by other birds revealing locations of their nests, or by simply stopping and listening for calls of the nestlings, their main source of food. A solitary bird, spending much time perched quietly below the forest canopy. It hunts in flight or from its concealed perch, sometimes chasing its prey in the open for up to 1.5km. These birds have a superb ability to fly at high speeds under the forest canopy. They are amongst the noisier of raptors with a very clear and loud alarm call and the juveniles are particularly noisy making a high pitched “weeeeeeeeh” call when asking for food. Something of a bird specialist (up to 98% of their diet) their main prey can be found amongst the pigeon and doves – in Kloof that means Laughing Doves and Red-eyed Doves. However they have been reported attacking Egyptian Geese – shame. This little raptor is about the size of a Laughing Dove, which is sometimes included in their diet! In fact, when perched, could easily be mistaken for a dove. 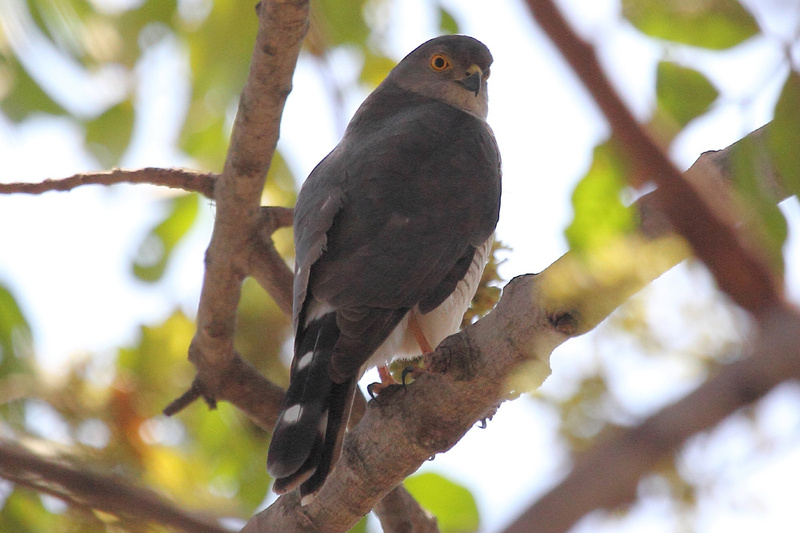 It looks much like a smaller version of the African Goshawk. Enjoys forest edges and tall dense riverine woodland. They are well-established in our suburbia though they are very secretive. 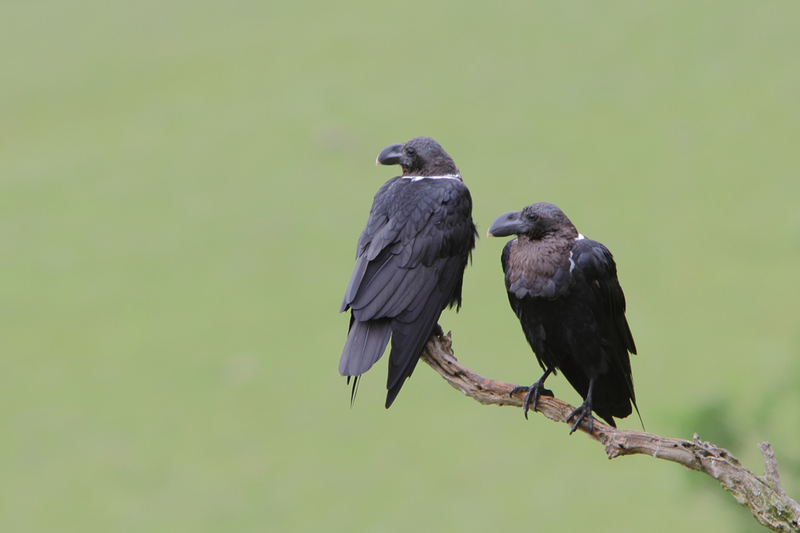 They hunt from a perch, feeding from a cross-section of all the small birds in our area. 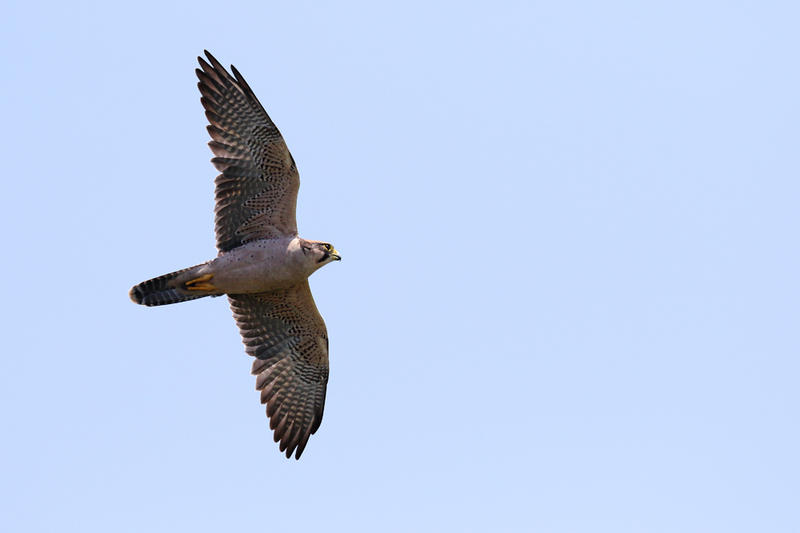 The Lanner is slightly larger than its cousin the Peregrine, and the coloration tends to be rufous or brownish. 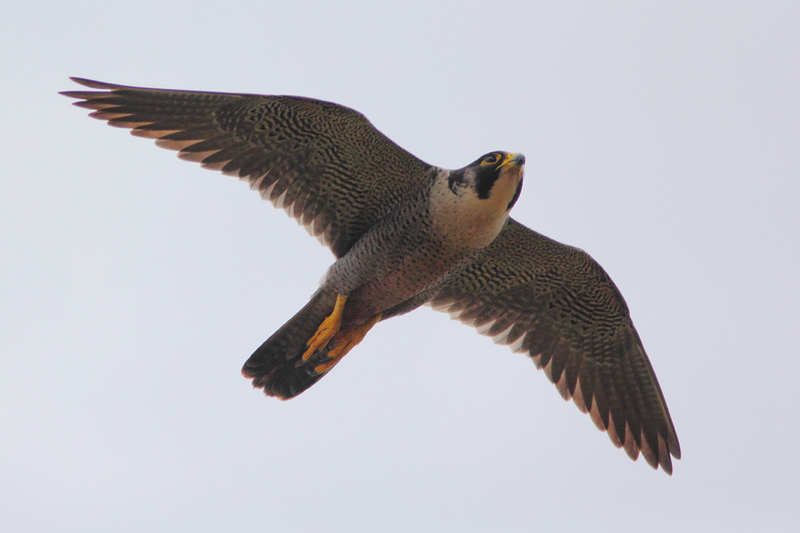 The underparts are plain whereas the Peregrine is striped. You can tell it is a falcon from the malar stripe which comes down the side of the head. Breeding pairs favour habitats with cliffs or equivalent, often perching prominently. 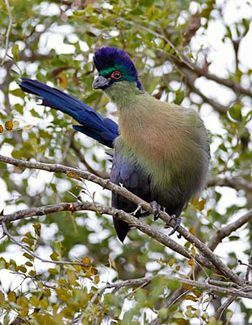 They can often be spotted in Krantzkloof in the vicinity of the Lingwood Trig Beacon. They hunt from a high perch or from the air, primarily using speed to surprise their prey, but are also adept at using obstructive cover to mask their approach. Either attacks directly in a steep dive or it levels out in a fast coursing flight, low over ground, striking at prey as it flushes. Important bird prey includes mousebirds and small seed eaters, though pigeons and doves tend to make up about 30-40% of their diet. They do include bats and other small mammals, reptiles and insects. The Peregrine is more compact and heavily built than the Lanner. The black cap gives it a ‘hangman’s hood’ appearance. Once again the favoured perch will be the cliffs overlooking mixtures of woodland, forest or even stretches of water. In Krantzkloof you will find them on the cliffs of the Nkutu Gorge. Prey is usually taken in mid-air after a fast downward stoop using gravity and a relatively heavy streamlined body to attain speeds of more than 300 km/hour. However I should declare my status with the Peregrine, since not many lists were submitted including the Peregrine, and it might have been snuck in the back door. 2.27% of the lists had the Peregrine, while 11% had the Lanner. My story is that across the valley from our home in Kloof there used to be a large gum-tree. There was a Peregrine perched in that tree from Dec 2010 to Aug 2011, and then again from Jan 2012 to Aug 2012. Then the developers cut it down! On the wing for an occasional snack! The next group of 4 would consider birds as a delicacy worth having, but not as the main course. We have covered this species before and most residents of Kloof will be familiar with it due to the relatively high number of nesting sites in the area. The photo shows both male (right) and female on the nest at Ronald’s Kloof with this years eaglet shortly after hatching on 25th September. 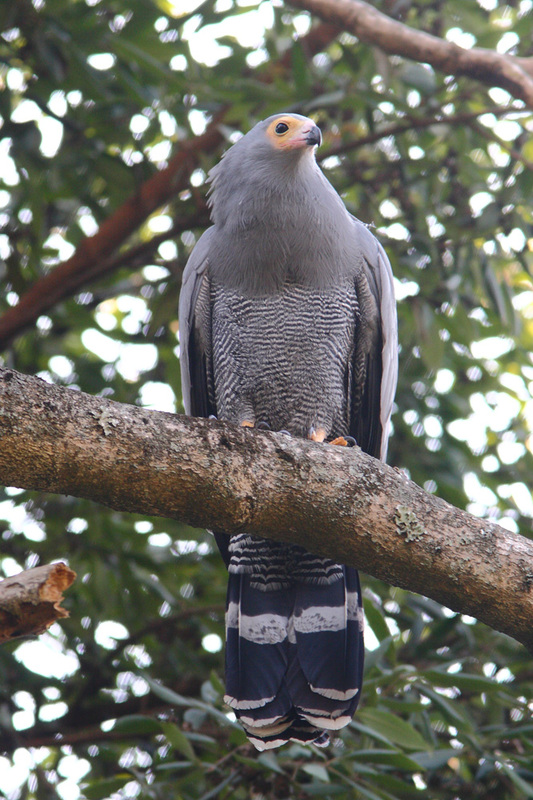 This species can be regularly seen in the Nkutu Gorge. This species also nests in Krantzkloof with one well known nesting site in the vicinity of Watsonia Place. But it is not only birds that eat birds! There is no priority order for those snakes Pat McKrill and I have selected as known bird eaters or nest invaders that occur in Kloof. Each species is identified as being either a forager (f), an ambusher (a) or a specialist egg-eater (e). Boomslang (f) (e) – birds, nestlings, eggs (eaten whole). The pigeon fancier’s nemesis. Common Egg-eater (e) – exclusively birds eggs – the pigeon fancier’s nemesis. Southern African Rock Python (a) – chicken farmer’s nightmare. There are many troops of monkeys in suburban Kloof, and at times they are hungry in spite of having a remarkable degree of free entry to gardens with their variety of plant foods. Unfortunately they are not only vegetarians. They do have the nimbleness to reach into birds nests, with nestlings the target. The size of the problem is not known. A study in the USA recently came up with the claim that domestic cats kill many more wild birds than previously assumed. Their estimate was between 1.3 billion and 4.0 billion birds a year. Wow! The estimate in the UK is 275 million. With the USA people population 5 times that of the UK, the comparative figure for birds would be 1.4 billion – not out of line with the USA estimate. Certainly it is a subject of concern with the RSPB (Royal Society for the Protection of Birds) in the UK, with calls to members to get involved. Whether the statement put out by the RSPB, that most of the birds killed by cats would have died anyway before the next breeding season, is valid or not is questionable and would depend rather on circumstances than being set as a golden rule. Considering both birds and monkeys, the problem becomes more serious when the bird/monkey takes up a favourite spot, such as at the base of a birdbath. Domestic cats are much more likely to adopt this practice to supplement their meals at home. To calculate scientifically how many the cats did not bring home, or how many escaped after being caught and subsequently died of its wounds, would seem to be impossible. These are deaths caused by man-made structures or moving vehicles. I guess we now have to take into account wind-farms. Birdlife South Africa has issued guidelines on Birds and Renewable Energy regarding the positioning of the turbines to minimise accidental deaths. There is a sadness in our family every time we find a dead bird on our verandah after hitting our glass windows. But we do feel slightly mollified when we collect the sample in a plastic bag, mark it and keep it in our freezer till we can deliver it to the Durban Natural Science Museum. David Allan, the curator of birds, said the oldest bird skin in the Durban collection dated back to 1895. This collection of skins is invaluable as a scientific resource for many years to come. So similarly the birds that have died in our area are all contributors to our rich biodiversity – a subject we are still a long way from understanding.